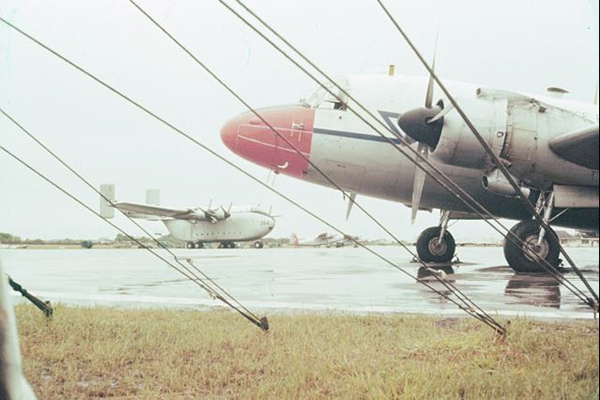 The Air Force (Australian, New Zealand and British) operated in and around Malaya, Singapore, Brunei and Borneo throughout the 1950's and 1960's. We shall publish some of their stories on this page. I remember our CO was Major Chilman and his 2i/c was Captain Birkett. Most of us from 732 Stores Transit Platoon eventually returned to the UK on completion of our tour. Others opted to stay in Singapore at 3 BOD." 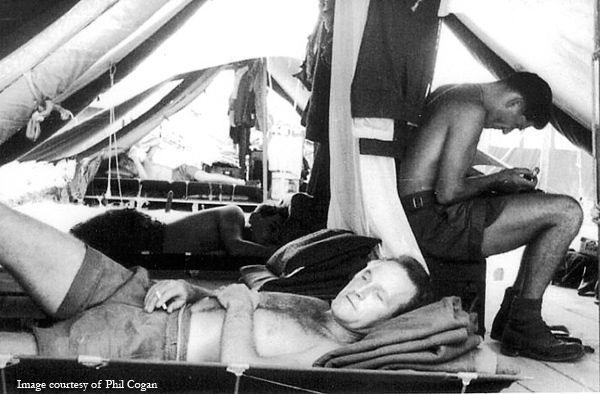 Here are Phil's images from those days 45 years ago. The 'Surrender Stone' near Layang Layangang beach, Labuan. 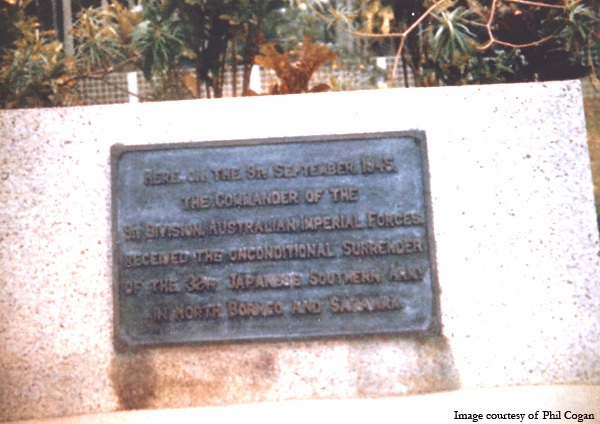 This is where the Japanese Forces surrendered to the Australians on 9 September 1945. 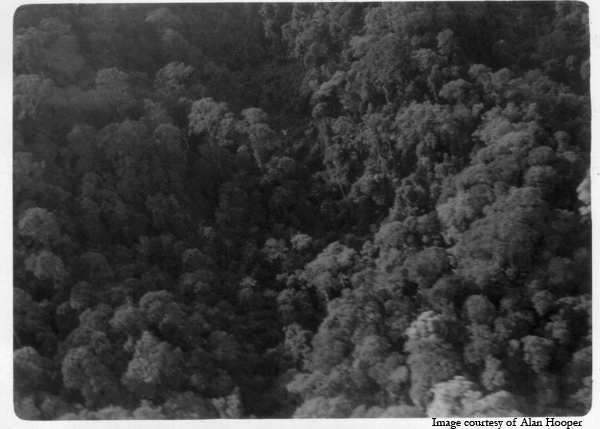 This was taken in March 1963. 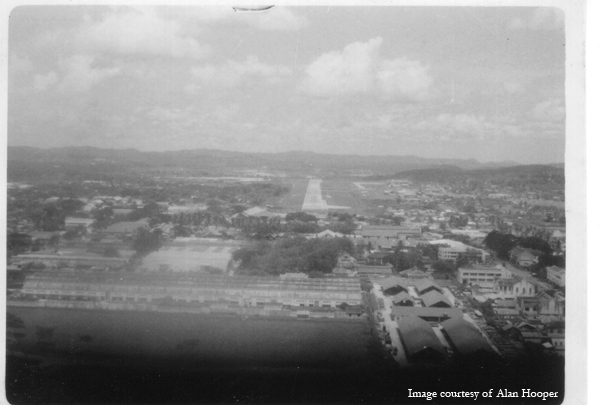 99 OFP Guardroom, Labuan airstrip 1963. Me on the right with Peter (Taffy) Green. 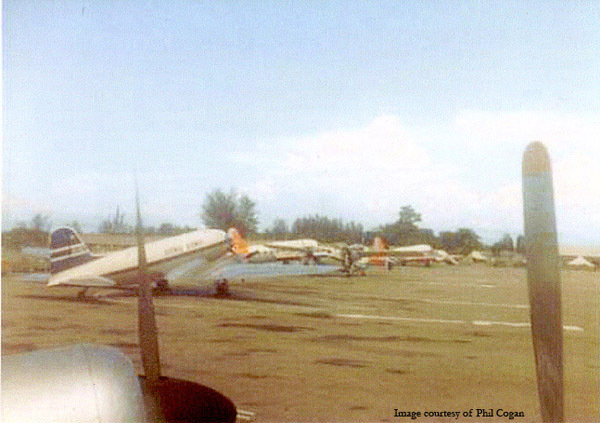 Taken from window of Hastings on touchdown at Labuan airstrip 1963. Showing 99 OFP. The RAF were on the other side of the airstrip. A mate ready for patrol, with me on the left. 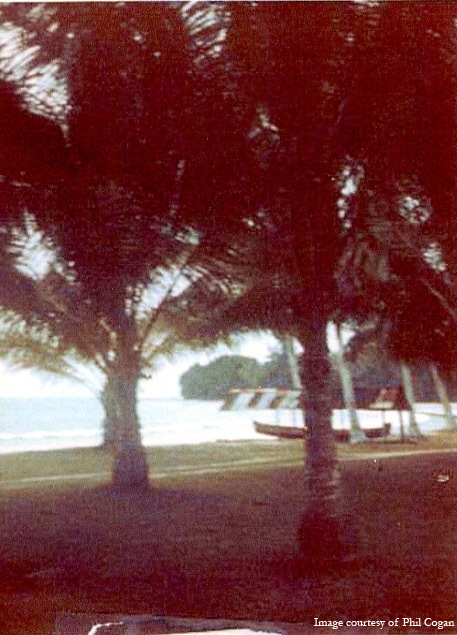 99 OFP Labuan 1963. 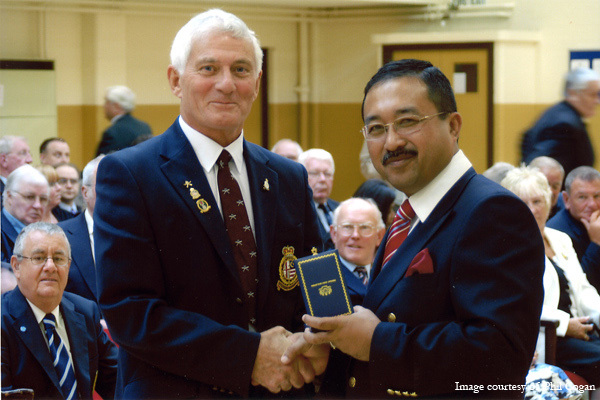 Presentation of my PJM medal at the TA Centre, Seaburn, Sunderland on 4 August 2007. Our thanks to Phil for sending us his memories and those brilliant images. John was in the RAF. He now lives in Australia and, like Gerry Law and Paul Alders above, he is a leader in this campaign for the right to wear the PJM. John has sent us some images that we think will bring back many memories to many people - they are displayed courtesy of him and they are his copyright. 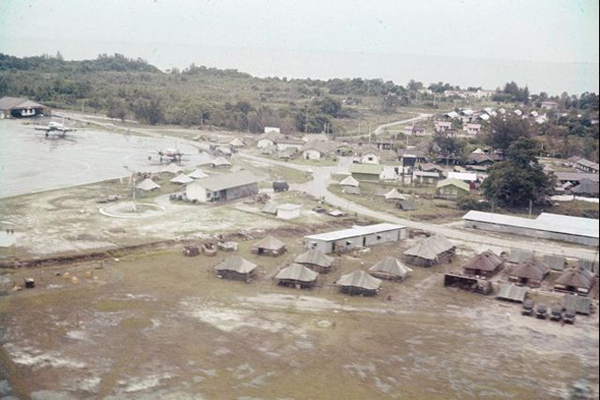 The huts that were built to accommodate RAF other ranks at RAF Labuan, early 1963. "Me on the left, the other lad is sitting on my "charp". An Army stretcher bed. 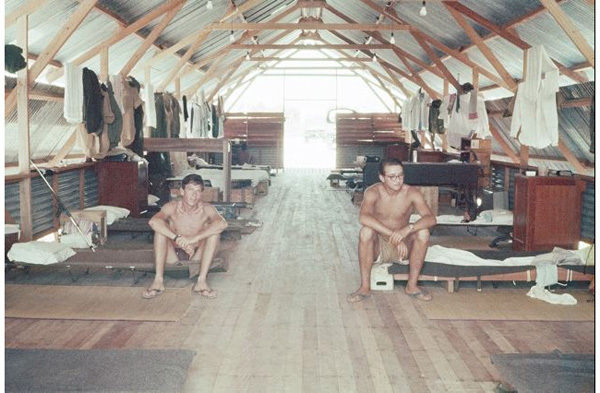 We used to obtain planks from packing cases and make a bed frame. We tied our stretcher beds to the frame. That way we didn't fall out of the charp when we turned over in the night. Note that the huts or 'longhouses' were open all the way down the sides and open at each end. 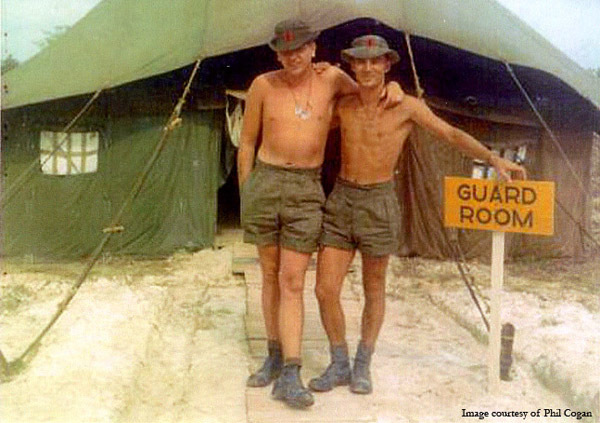 How the hell the RAF got real bedside cupboards for us I don't know." 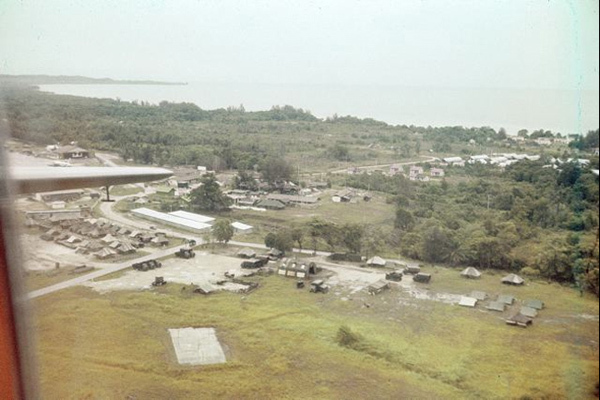 RAF Labuan. Early 1963. You can see the 'corner' that was 52 Squadron. "There is one Valetta standing in the corner. The wooden longhouses are centre right towards the beach - a large group of them. Right down at the beach was the Shell Club - Ossifers for the use of. The tents and tin sheds (ablution block),at bottom right were used by the Gurkhas. A Hastings is visible at the far left." A Valetta of 52 Squadron - a Beverley in the background. Twin Pioneers in the distance. This slide has written on it. "Farewell to Labuan". Probably not my last detachment there. The Shell Club is more visible, down on the beach, as is the group of longhouses. Finals at Kuching airport. Sarawak. Aircraft is a Valetta of 52 Squadron. 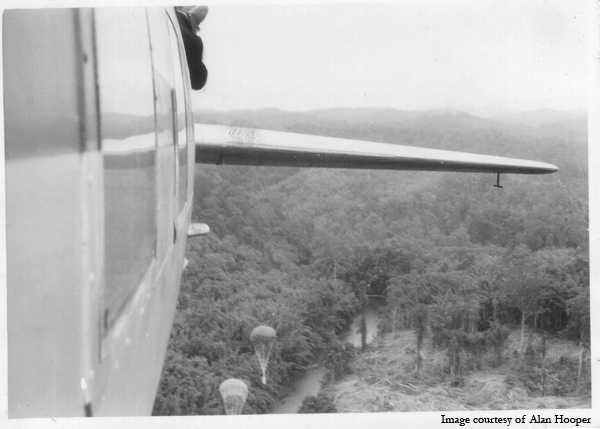 Supply Drop somewhere in either Borneo or Sarawak. "If you look above the coffee cup you'll see a small field with a white mark. The white mark is a cross. The target for the drop. Apart from viewing the upside down compass, the mirror was also used by the pilot to look down the fuselage to where the Army RASC boys were. 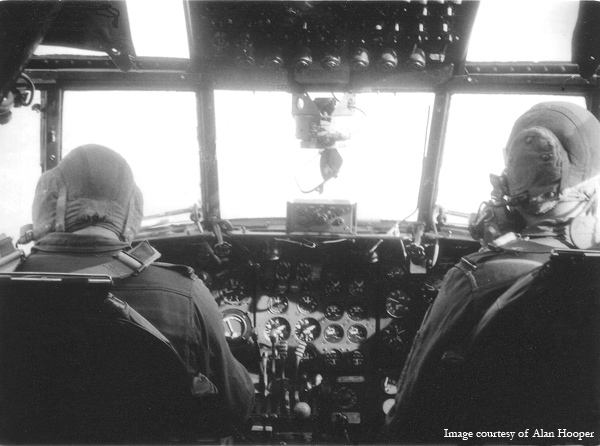 They pushed the load out on the command of the pilot (he pushed a button which turned on a red light, near the door). He watched the load going out and then when the RASC boys gave him a wave he knew that the load had gone and that he could fly to wherever he wanted to go." Our thanks to John for these brilliant images. 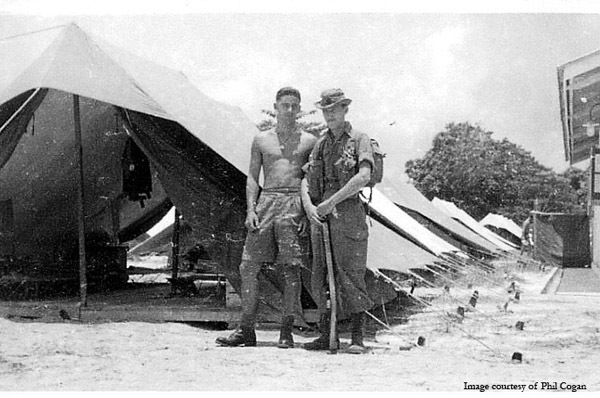 "I was posted out to Singapore (Seletar) in 1957, as a W/Op I worked in the Rescue Co-Ordnination Centre (Signals) Section. 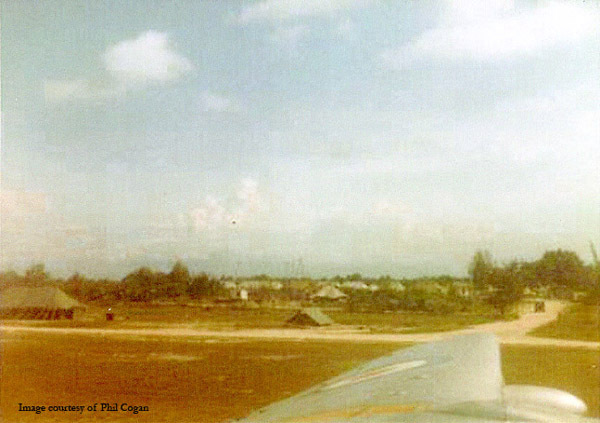 After a year there I was posted up to HQ 224 Group (Signals) at Kuala Lumpur and spent the rest of my tour there, although 224 Gp moved to Singapore, the Commcen remained as RAF KL Signals. Being very keen on aircraft I took every oppotunity to get flights with the various Sqn's at KL, particularly 52 Sqn Valettas. Attached are a three pics I took whilst on one of those flights, the first shows the Pilot & Co-pilot (I think), FlyOff Thomas and FlyOff Angus of Valetta 809, the second is a view of a DZ (Tango), you can just pick out the letter "T" in the trees, and the third shows the Despatcher looking out the door after a Supply Drop." "Pilot & Co-pilot (I think), FlyOff Thomas and FlyOff Angus of Valetta 809"
"A view of a DZ (Tango), you can just pick out the letter 'T' in the trees." The Despatcher looking out the door after a Supply Drop." 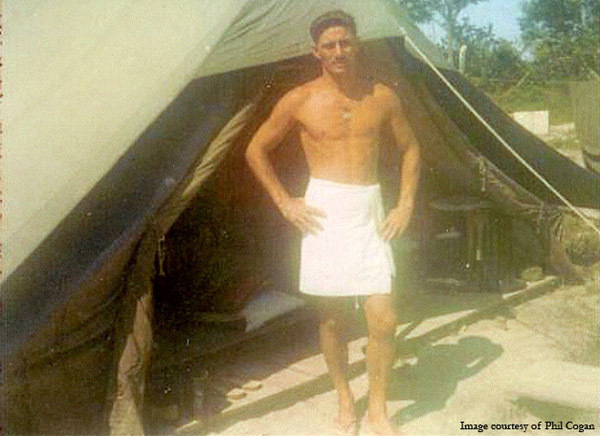 "I served with RAF in the Far East from 1957-58 at RAF Seletar, then on posting spent the rest of my tour at RAF Kuala Lumpur (1958-60) in the Wireless Cabin of the Commcen. I was very keen on flying in those days and often talked my way onto the Valettas of 52 Sqn, as well as the occasional flight with the Whirlwind and Sycamore helicopters. Attached are some of the photos I took. 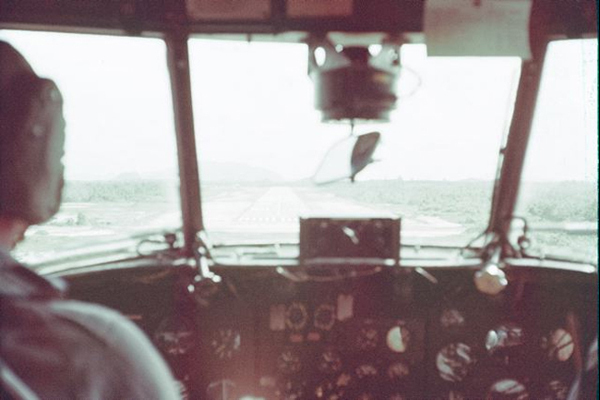 The first one is taken in the cockpit of a Valetta approaching KL." 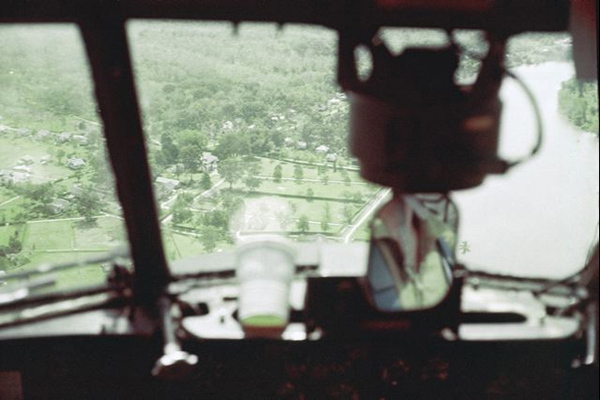 "In the cockpit of a Valetta approaching KL." We'd like to thank Alan for sending in these images for us all to enjoy.